Mount Shasta is the retreat to go to. Mount Shasta is in Northern California, almost at the Oregon border. I got a bit dizzy while at a rest stop looking at a state map on my first trip there from Southern California. That’s how far North we are!? Nevertheless, a three-day weekend retreat with Himalayan Master Yogiraj at this mountain is a must. He often refers to it as the American Mount Kailash, which is perhaps the holiest mountain in the Himalayas. It is interesting to note that the native Americans refer to Shasta as Adi-Nar, which is very similar to one of the Sanskrit names for Lord Shiva: Adi-Nath. The retreat is a weekend of freeing our minds. The mind, the root source of all disease, loses its iron grip. Healing and sweet, deep consciousness fill the void. That is the essence of any time spent with Yogiraj. After years of retreats, I easily fall into the rhythm. During the satsang question-and-answer sessions, his answers are sometimes heavy with authority. The next moment they are playful and teasing; spontaneous discourses into the ancient lore of India, yogic healing transmissions, chanting and community. When Yogiraj entered the meditation hall at the start of last year’s retreat, my mood somehow lightened, erasing my two-day journey North. There were about twenty new people sitting up front and he wanted to make sure they felt comfortable and accepted. Old timers, such as myself, left unchecked can hog the question-and-answer sessions. Yogiraj caught us in the act and gave special attention to the newbies. Saturday’s big event was the outdoor meditation on Mt. Shasta at an open field called “Sand Flat”. Yogiraj came and then we spread out across the whole field and forest for meditation. He took us with him as he sat in meditation, going into deeper levels of consciousness. The Guru is like a benevolent black hole, sucking all negativity into its void. The bees and flies were buzzing and the late morning sun beat down. Nevertheless, we remained in meditation, or something that at least looked like it. Afterwards Yogiraj called us together and told us that he had taken us into Nirvikalpa Samadhi, the deepest layer of mindlessness. Did I mention that Mount Shasta is the retreat to go to? 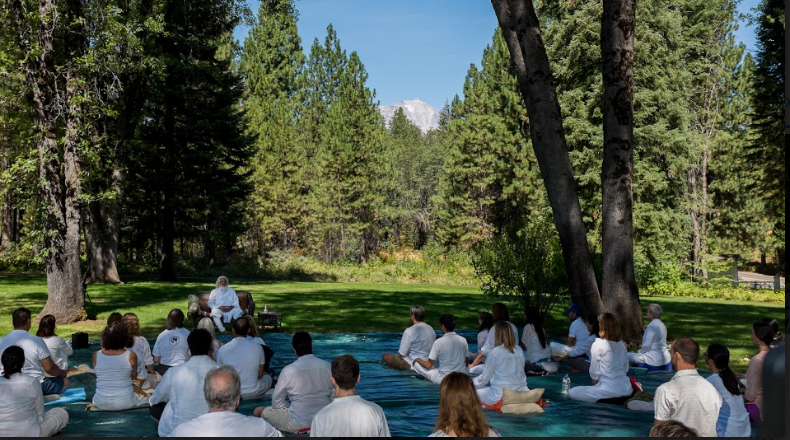 You can join Yogiraj and our spiritual family this summer at Mount Shasta. Learn more at our U.S. Events Page.